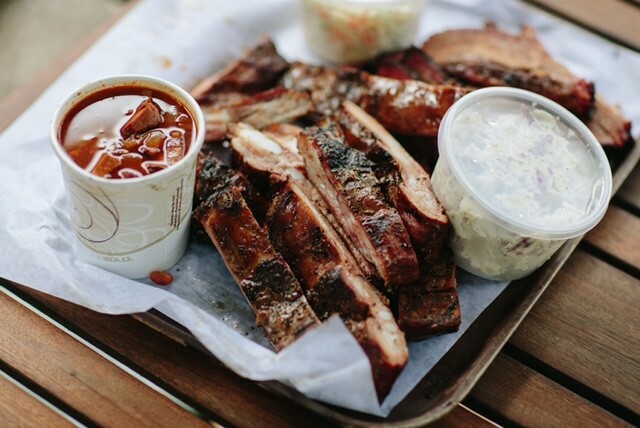 There’s a new bbq on cape cod, located in the waterfront village of Woods Hole, Falmouth. One of the new trends in the culinary world is the movement of pop up restaurants. Sugs bbq “popped up” when co-founders Nat and Kristan Chalkley brainstormed with Pie in The Sky owner and friend Erik Gura about bringing Nat’s passion for smoking bbq to life. 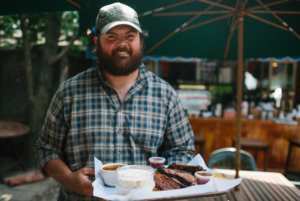 As this exciting new venture for Nat takes off he is serving fresh smoked meats and sides right out of his smoker in the Pie in The Sky courtyard on Saturday and Sunday from 1-8 pm all summer long. 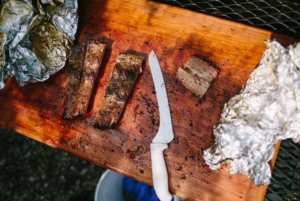 The two shining stars of Sug’s menu are his brisket and pork ribs, both smoked over night. 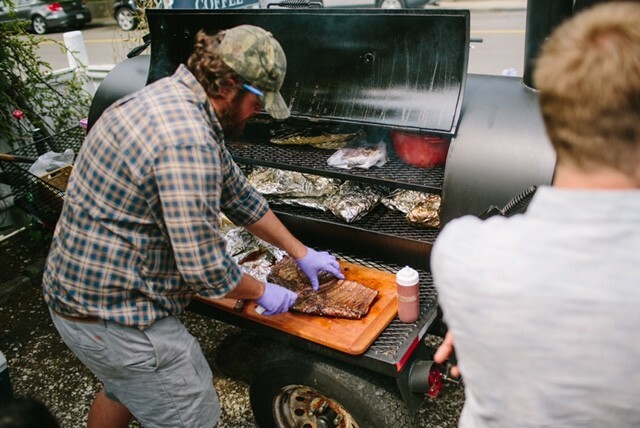 Each week Nat will include an additional special such as smoked chicken leg quarters or pulled pork. The featured sides are also not to be forgotten including potato salad, corn bread, and coleslaw. To add even more to this culinary experience, there will be live music from 4-6pm and feel free to byob while dining in the courtyard. Feeling like a little surf to add to your turf? Pie in The sky also has a pop up oyster bar on the other side courtyard. Sugs co-founder, Kristan Chalkley has been a Pie in The Sky bakery fixture for 10 years, even before Erik purchased the bakery. Nat and Erik having been friends for years fueled the ties between Sugs and Pie in The Sky. Nat is a successful fisherman and finally this year decided to put a different passion on the forefront. With the help of his wife Kristan, friends, and family this summer was his time. 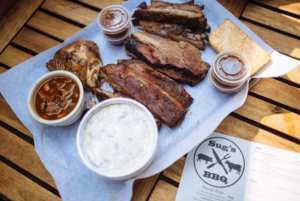 Follow their summer adventure on Sugs instagram page @sugs_bbq.